Look elsewhere if you’re seeking outrageously complicated sushi rolls that assault tradition with ingredients like cream cheese, foie gras, and fried chicken. 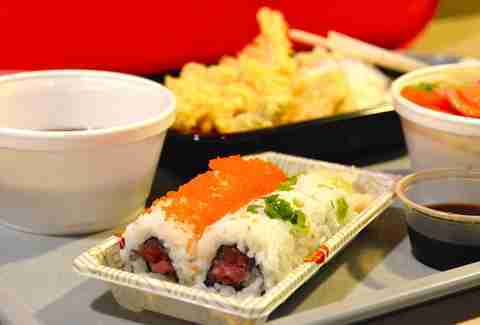 Every time someone orders a roll with these whacked ingredients, a Hello Kitty loses her bow. What you’ll find here are the 10 best Japanese restaurants in DC that could actually be right at home on streets Japan, ranked in order of excellence. Step into Sushi Express, tucked into a K St office building, and you’re instantly transported to the kind of place where you’d pick up a bento box before boarding a bullet train in Japan. Sure, it’s lit like a doctor’s office, and Styrofoam replaces fine china, but the value can’t be overstated. Also, take comfort knowing that Chef Yoshifumi Yasuoka’s been at this for 30 years, and he’ll remember your order after one visit. Best bet: Something off of their $7.50 "combinations" menu, which lets you marry two dishes, plus rice and salad. Think assorted tempura plus a sushi roll. Don’t miss the mini-fridge filled with mochi desserts. Pro tip: cash only! This seems to be where Japanophiles hang out to test their Japanese language skills on waitstaff. Fortunately, these folks also know good food when they see it. The simple menu covers several tiers of the Japanese food pyramid: sushi, ramen, and donburi. The new restaurant is so small, you might be asked to share a table if you're solo, and you better believe it’s with one of those Japanophiles. 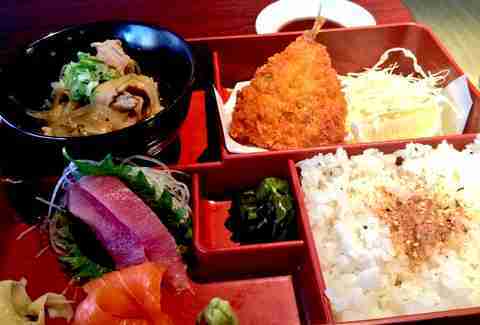 Best bet: A $15 lunchtime bento box with soup, salad, sashimi, fried fish with tonkatsu sauce, rice, and a compartment of some kind of Japanese comfort food that tastes like someone’s Grandma made it. The vibe: Inviting; approachable; Jiro Dreams of Sushi. This Hill haunt is most worthy of being your go-to once a week kind of place because they do take-out and are generally willing to please. 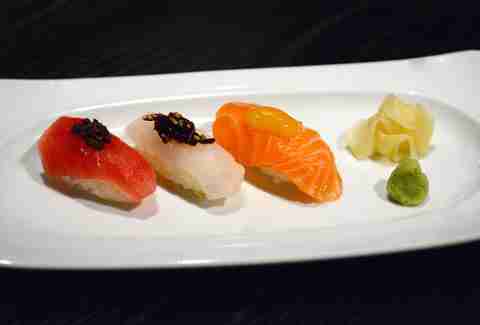 Nigiri and maki are the focus, with a handful of appetizers from the kitchen. Best bet: The sushi omakase-tasting is the closest you can get to having a Jiro-like experience for a price tag that astounds at $50. 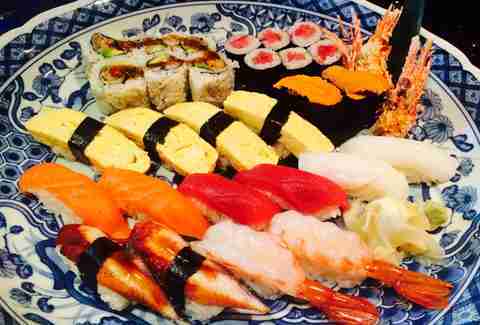 Chef/owner Minoru Ogawa feeds you piece-by-piece from behind the sushi bar until you tap out. It’s available at the sushi bar only, so call for reservations. The vibe: Sleek; revived; varied. When Zentan’s scored Chef Yo Matsuzaki from San Francisco, it was a win for DC, because he brings both inventive Japanese bar bites and comfort food to the table. The drink program has upped its game too -- including two Japanese whisky flights. Best bet: Not even your dad on his best day can grill like Matsuzaki. 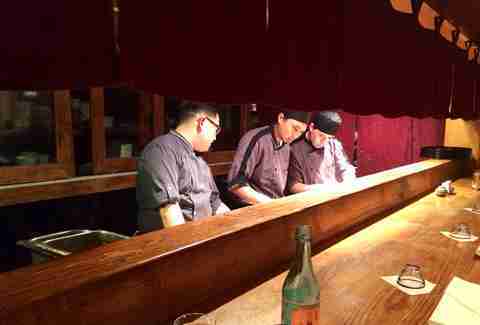 That’s why you’re ordering every single one of his yakitori skewers hot off the robata grill. The ones starring bacon are especially memorable (duh!). Note too that Zentan offers intimate omakase dinners on Thursday nights by reservation only, and you get some face time with the chef. The vibe: Trendy; interpretive; buzzed. The space is one of the sexiest in the city, so settle in while asking yourself, "Am I cool enough to be in here?" Yes. You are. 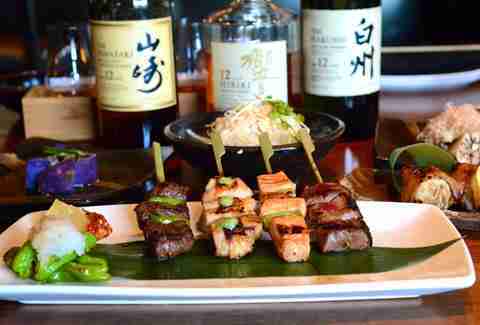 All of the dishes are designed to pair well with booze, which is a good thing since the drink program has depth in all departments (but especially sake, shochu, and whisky). 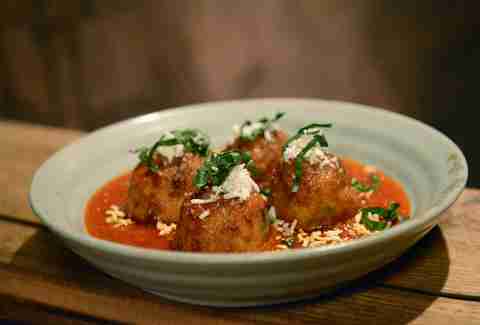 Best bet: Whatever you order to eat will be interesting, like these fried octopus balls commonly eaten as street food in Osaka, or the savory "hambagu" steak. Don’t forget about the ramen shop downstairs, nor the fact that Daikaya serves brunch. The vibe: Elegant; refined; business lunch. The Downtown address means suits will surround you as you work your way through the menu from one of DC’s fathers of Japanese cuisine -- Kaz Okochi. The dining room just got a new design and it’s eye-catching. Best bet: A selection of Kaz’s speciality nigiri that doesn’t stop at soy sauce and wasabi when it comes to sushi accelerators. The Nagoya native adorns slices of raw fish with herb miso, sweet kombu, and chili-daikon. The vibe: Established; slightly suburban (kids may drum chopsticks); innovative. Sushiko’s been slicing raw fish since the '70s, but that doesn’t mean the restaurant is without new tricks. In fact, its full of them, like this cherry-wood-smoked Tasmanian ocean trout tartare dotted with goat cheese. 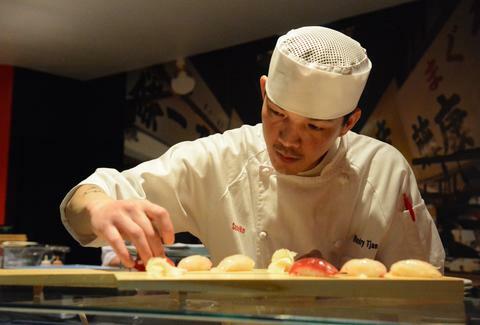 Best bet: The $90 chef’s tasting menu served at the sushi bar. You’re wondering if it’s worth the cost of a one-month gym member? Indeed. The nine courses alternate between goodies from the kitchen and treasures from the sushi bar. 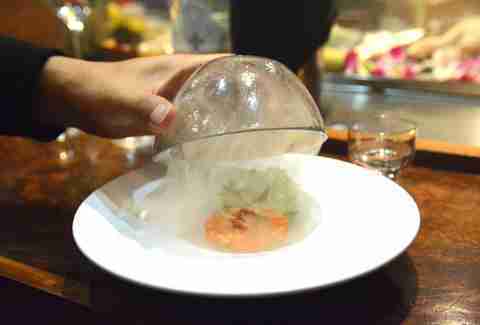 Your front-and-center seat means you can watch chefs envelop tongues of uni with dashi gelée. The vibe: Serious; tranquil; bossy in the best possible way. Get past the rules designed to make Americans behave better during the meal (silenced cell phones, slippers, business-casual duds) and put your lunch or dinner in the hands of the chef. An omakase (chef’s choice) tasting menu is the only option. The parade of courses will take you through raw things, grilled things, fried things, and beyond. Expect to be told how to eat each bite and take heed. Best bet: Request counter seating so you can watch the chefs at work. Also be sure to visit Kotobuki upstairs. Their à la carte sushi menu is gentler on the budget. The vibe: Neighborhood hang; convivial; family business. Japanese pubs like Izakaya Seki line most alleys in Japan, each serving snacks deemed to go well with brain-freeze inducing pints of beer or carafes of sake. If neither of these tickle your imbibing-preferences, the father-daughter run restaurant has a steep collection of Japanese whisky (yes, no "e"). 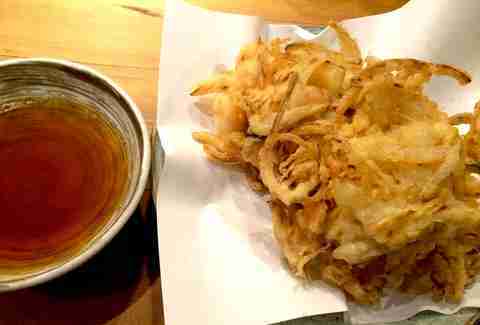 Best bet: Find your (rice) balls and order something you’ve never heard of or can’t pronounce, like a fried-fish-and-veggie fritter called "kakiage" (pictured), grilled hamachi kama, or fresh sea urchin (for which they’ll scrape out of the spines right in front of you). The vibe: Efficient; perfectionist; authentic. Best bet: Save the fancy stuff for a special occasion and hone in on happy hour. From 5:30-7pm in the bar area, all sushi is half-price. So are draft beers and sake. You can escape a little tipsy and full of raw fish for about $30 per person.